An estimated 5,000 Palin-lovers are expected to swarm Fairbank's Pioneer Park for a resignation celebration. Sarah Palin will step out of office Alaska-style--with a bathtub race, square dancing and a picnic serving as a backdrop for the Governor's transfer of power. The onetime vice presidential candidate's exit coincides with the annual Fairbanks picnic, and the final weekend of Golden Days, a week long celebration commemorating the area's gold rush history. The town is preparing for media mayhem, The Fairbanks Daily News Minerreported. "We're expecting some big media attention this year," Lisa Herbert of the Fairbanks Chamber of Commerce said. "I think it's going to be great for Fairbanks." Great for attention-loving Palin. The hockey mom is expected to draw crowds of 5,000, including swarms of media from the lower 48, who might get footage of Palin serving up cuisine or participating in a parade of floats made of duct tape in the Red Green River Regatta. The official resignation will take place in front of the Queen of The Yukon riverboat, which Lt. Gov. Sean Parnell will board to take his oath of office. Alaska’s Military Affairs Commissioner, Lt. Gen. Craig Campbell may be sworn in as Lt. governor at that time. The party will wrap up beneath the Square Dance Gazebo for cake and punch. This will be the third consecutive year Palin will use the state picnic as a personal stage. 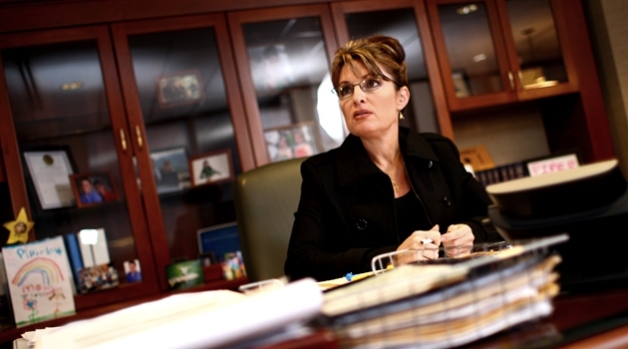 In 2007 she attended the down home bash after signing the Alaska Gasline Inducement Act into law, and in 2008, just before she hit the national campaign trail, she basked in celebrity glory before a crowd of 3,000 adoring picnic goers. Festivities will kick off at 3 p.m., and don't worry if you can't be there in person. CSPAN was the first to RSVP.